Ian was an ordinary young man who stumbled upon something that imbued him with “the power of Hercules”. 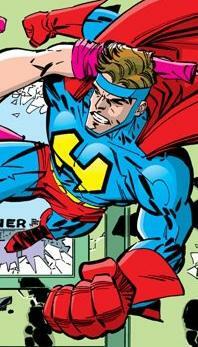 He became transformed into an impressive figure and decided to take up crime-fighting as the hero Herculian. When the Special Operations Strikeforce was increasing their roster in preparation for taking on Emperor Kurr, Herculian was one of the heroes recruited for the team. This first mission proved to be a complete failure when Kurr slaughtered almost the entire group of heroes. Herculian survived this massacre and after several months on life support, he finally made a full recovery. Whilst on a solo mission, Herculian attempted to foil a bank robbery being performed by the villainess Punchin’ Judy. After a brutal battle, Judy ended up ripping the heart out of her opponent and killed Herculian instantly.